This guest post was submitted by 3 students in Harbor House, a grade 7-8 middle school team at Williston Central School. Thank you to Elizabeth, Ava, and Abby for sharing your perspective on a recent Humanities unit of study. Last week in Language Arts class we had a trial about whether or not the US was right to drop the two atomic bombs on Japan at the end of WWII. 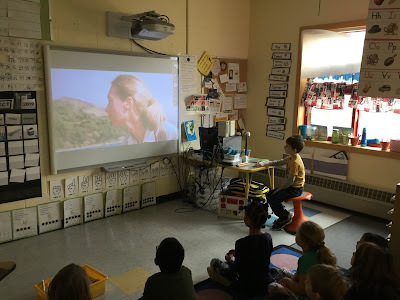 We think everyone in our class enjoyed it a lot. We were split into different roles, it was all pretend, but the acting part of the activity really enhanced it. We split into two legal teams (prosecution and defense) of five people each. In addition, there were several witnesses that were called to the stand including a Japanese survivor, military advisers, doctors, President Truman, and some expert witnesses. The press researched newspapers and articles of 1945 and then interviewed witnesses and created a newspaper. 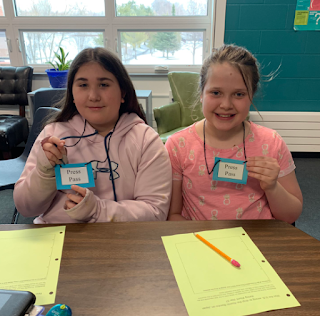 Each team had to research and find evidence to support their side of the trial. Each team had a different part to play and while everyone had the same amount of work to do, it looked different depending on their role. 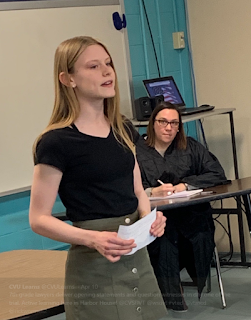 The legal teams worked on making a opening statement to present to the judge. 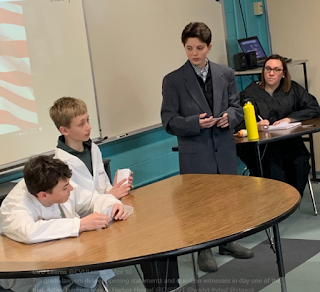 They also had to make up questions that they would interview their witnesses with, along with questions for the opposing teams witnesses. 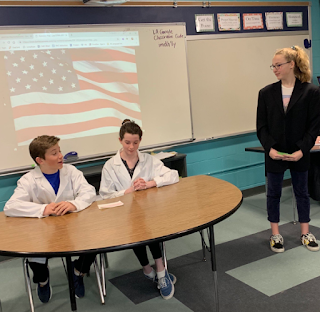 The witnesses (Japanese survivor, doctor, President Truman, Military advisers) had to research about their roles in real life and what the role's point of view was. This helped improve the arguments on both sides. The trial itself was like a game. One side would bring a fantastic piece of evidence and the other would try to top it off. It was intense, but in the end, we all really enjoyed this way of learning about argument writing. Evidence: I can use credible pieces of evidence to support my claim. Reasoning and Analysis: I can identify and interpret explicit evidence and implicit ideas that lead the audience to a deeper understanding of how they support my claim. Grammar, Usage, and Mechanics: I can independently apply standards of punctuation, spelling, grammar, and word use. Our last post was about classrooms connecting via Skype with Jane Goodall to learn about helping our planet. 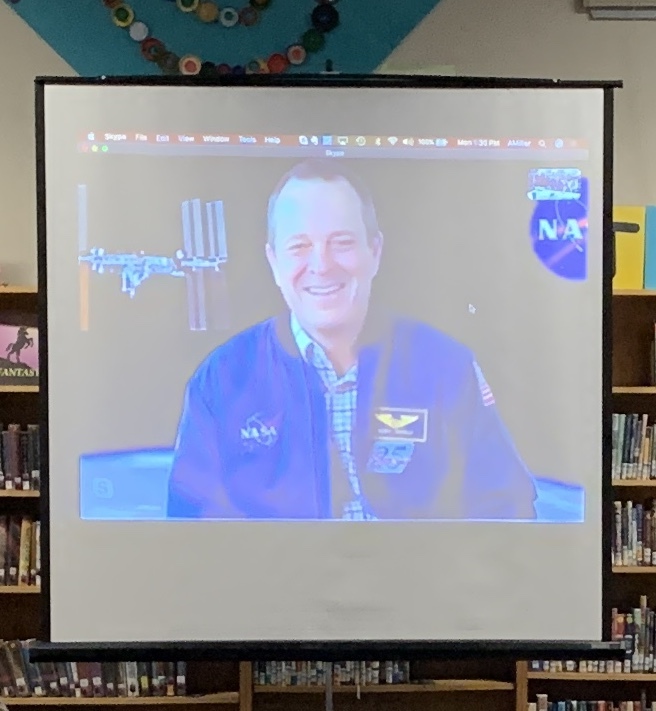 Today, fourth, fifth, and sixth grade students used Skype for a powerful conversation with Ricky Arnold, a NASA astronaut who recently returned from 6 months on the International Space Station. 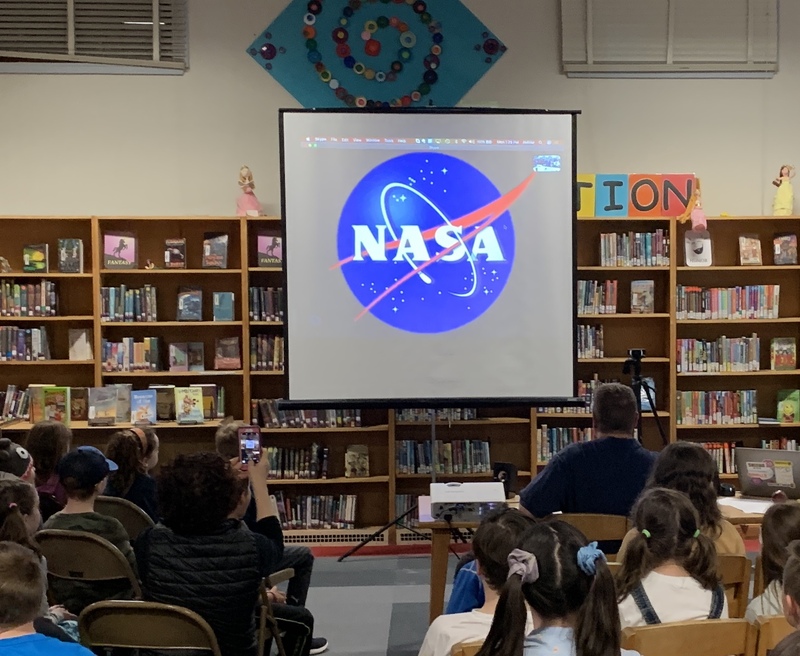 Tasha Grey, 6th grade teacher, and Allan Miller, digital learning leader, are returning to a unit they began last year by having students dig deep into current NASA research projects. They had put in a request to the astronaut office back in February seeing if any astronaut might be willing to Skype with CCS students to give them some first hand insights into life on the ISS and their role conducting these research projects.They found out late last week about the call today with Ricky Arnold. 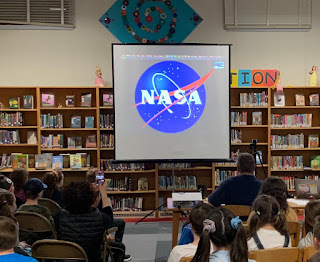 Ricky is one of three teachers that were selected as part of the Educator Astronaut program back in 2003 and his tour on the ISS was really focused on outreach and education. The Charlotte students did a fabulous job asking questions they had prepared ahead of time. And Ricky responded in such a way that everyone attending could easily understand. 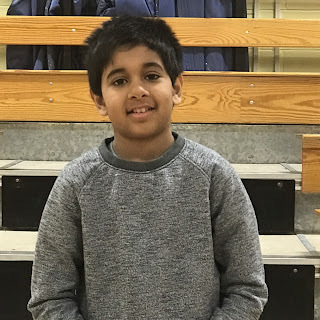 After a question about what it takes to become an astronaut, he said that in order to be an astronaut or work for NASA, you should study math and science, find what you enjoy and bring that skill to NASA when you're ready. He said one of the most surprising and exhilarating things about going into space is the view of Earth from there. It helped him appreciate that "all of the history of life has taken place on this beautiful, fragile place we call home. We have to take care of it; it's all we have." 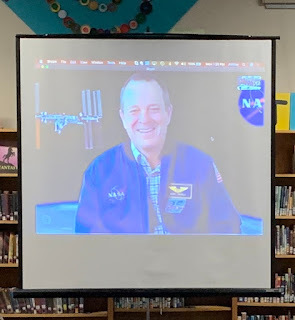 In response to questions the students asked, he shared that your body has to take time to adjust to life in space and also needs to do the same upon return to Earth. It took months for him to be comfortable going on hikes in the US after returning. He was not sure-footed nor comfortable in high places on hikes for a while. In terms of food, he mostly missed fresh fruits and vegetables. They grew some lettuce, but it didn't taste right. He closed by telling students that we all have gifts, some not yet uncovered, which you won't know you have until you try things. Allow yourself to face challenges and accept them. It it doesn't work, try again. It's great advice for all of us. 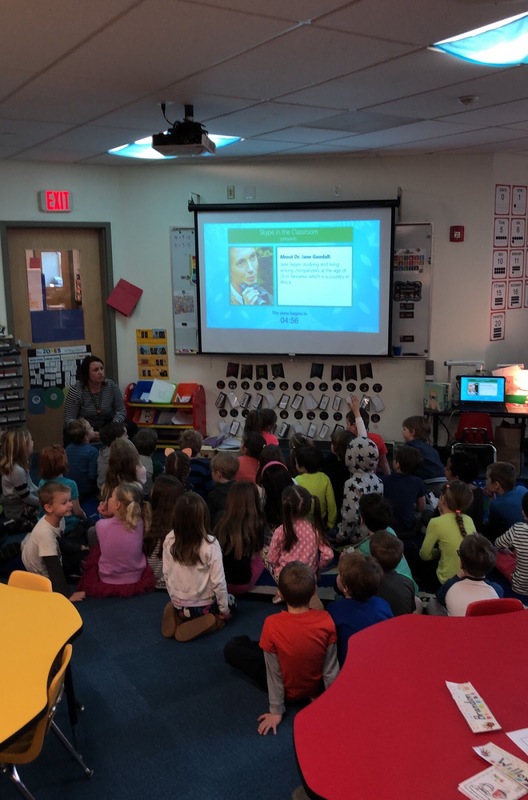 Many CVSD educators have incorporated the Global Goals for Sustainable Development into the classroom and the work they do with students. Earlier this morning, several of our kindergarten classes had an opportunity to connect with a famous expert to bring some of those goals to life. Sharon Davison, at the Allen Brook School, and Shannon Baird, at Shelburne Community School, have collaborated many times this school year. 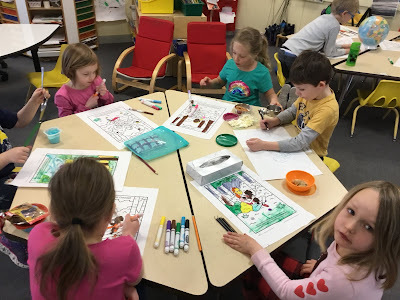 They share ideas, connect their kindergarten classes, and are helping to raise student (and parent!) awareness of the Global Goals. Sharon and Shannon have shared their experiences with others at workshops and conferences, most recently at the Kindergarten Conference in Burlington. 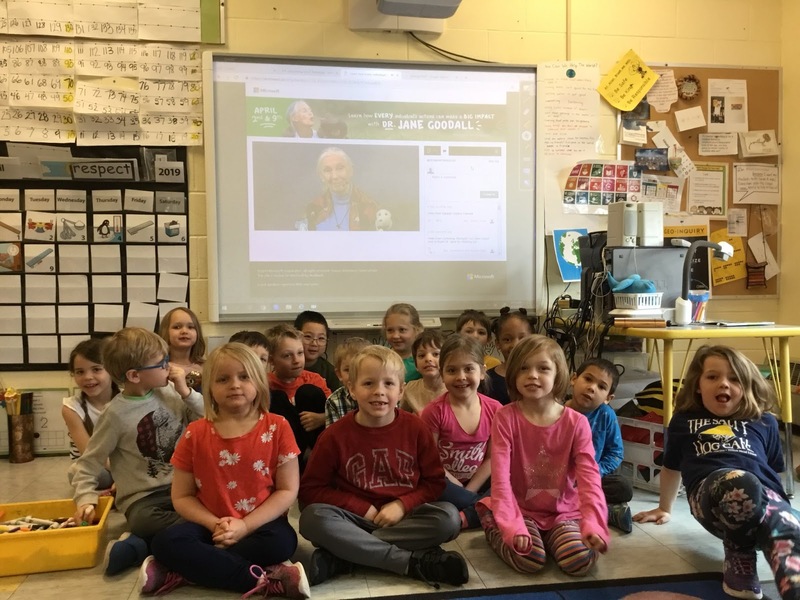 This morning, both classes, as well as others in our schools and around the world, participated in a Skype in the Classroom opportunity with Dr. Jane Goodall. 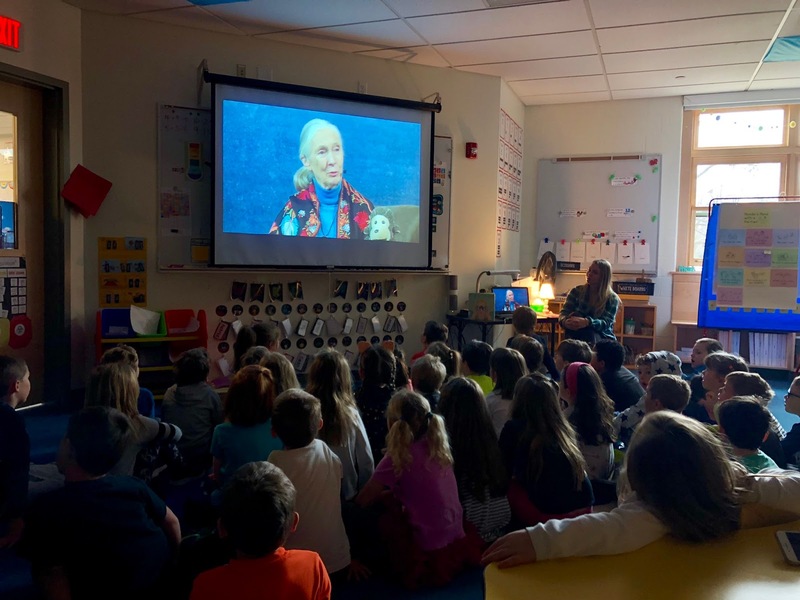 "Skype in the Classroom will celebrate Earth Day throughout the month of April to build awareness and inspire the next generation of sustainable leaders to take action. 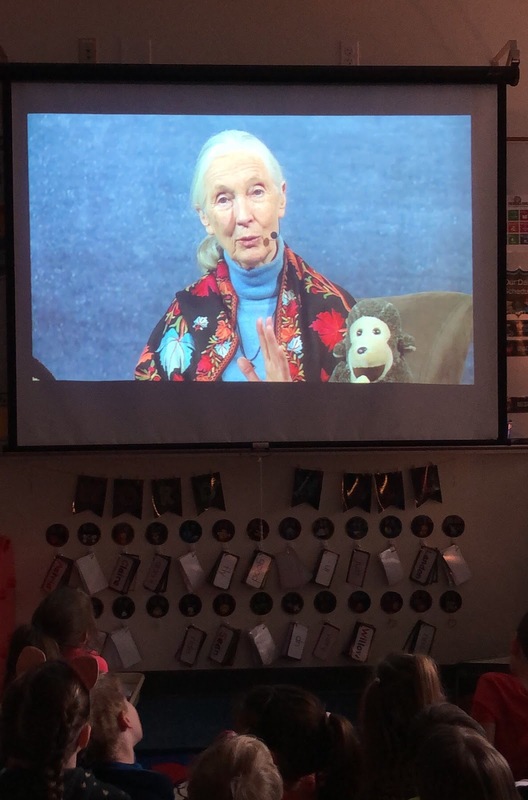 Today, Skype in the Classroom partnered with the Jane Goodall Institute’s Roots & Shoots program for a broadcast and live chat with Dr. Jane Goodall." Technology helps to bring more opportunities like this into our classrooms and our students benefit from these rich learning experiences. 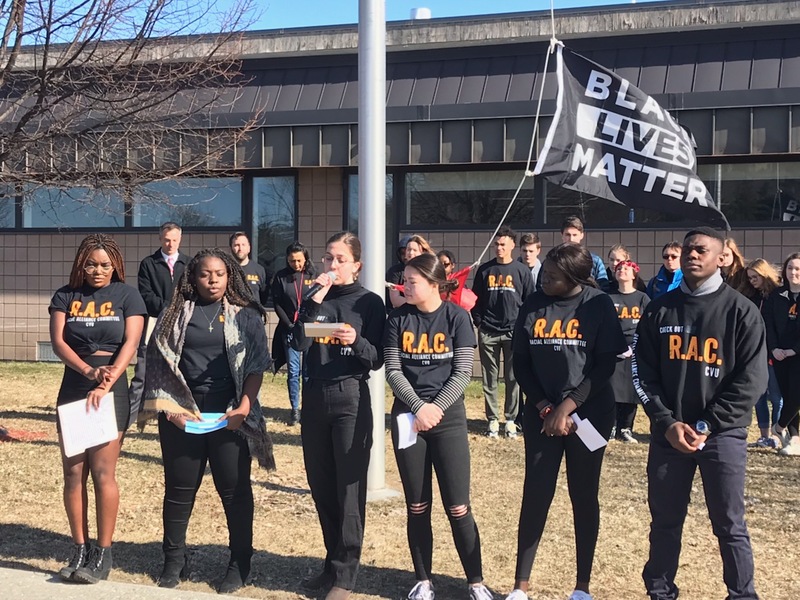 This morning at CVU, the Black Lives Matter flag was raised by the Champlain Valley Union High School's Racial Alliance Committee. 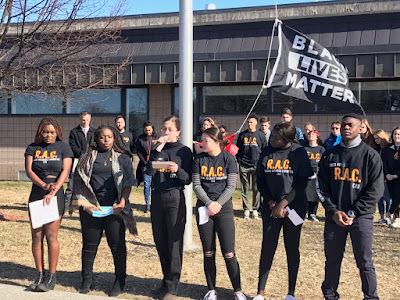 CVU's Racial Alliance Committee (RAC) brought forth a request to fly the Black Lives Matter flag at the February 19th Board of Directors meeting. 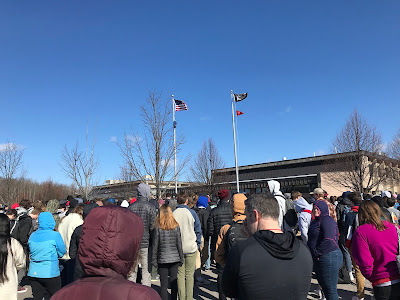 Overall, the committee collected over 800 signatures supporting their efforts to fly the flag at CVU. There were a number of presentations at that meeting, providing different perspectives on the request. The Champlain Valley School District’s Board of Directors continued the discussion on March 5th, with additional presentations by the audience, made up of students, parents, community members, and CVU educators. 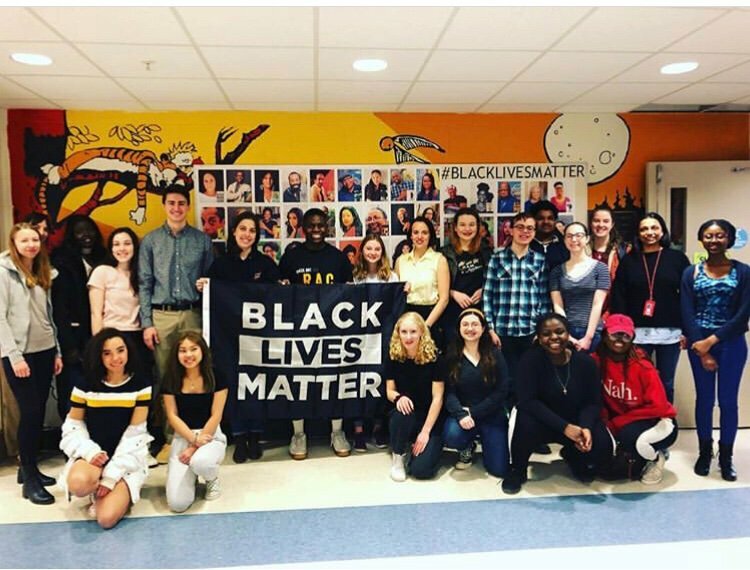 After lengthy discussion at the March 19th meeting, the CVSD Board of Directors voted to permit the Black Lives Matter flag to be raised. The flag will fly for 30 days. 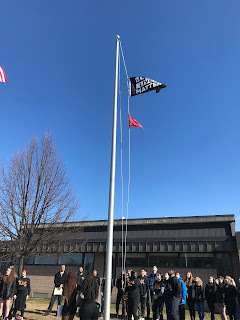 The motion that eventually passed read: “Consideration of further requests will be delayed until a CVSD flag policy is developed and approved, as charged to the policy committee. 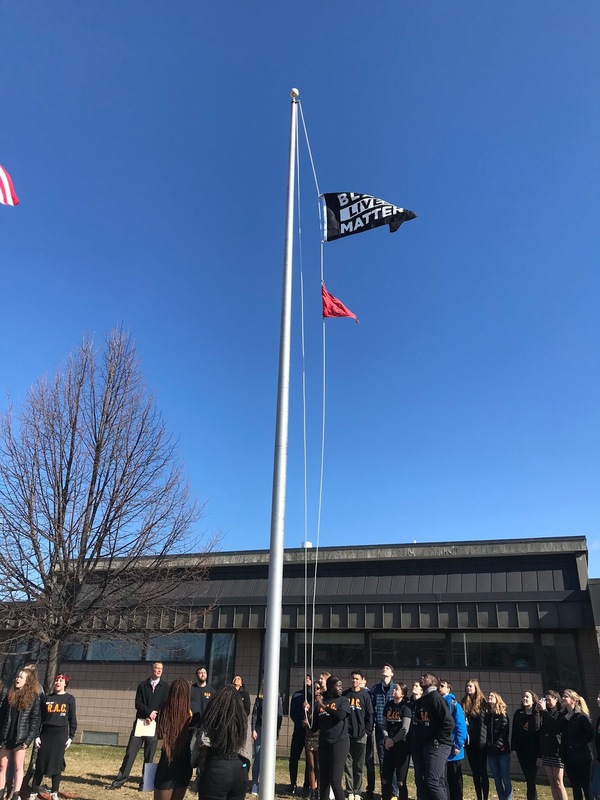 All groups requesting the flying of a flag will be subject to the new policy.” The CVSD School Board's policy committee is already at work on the new policy. 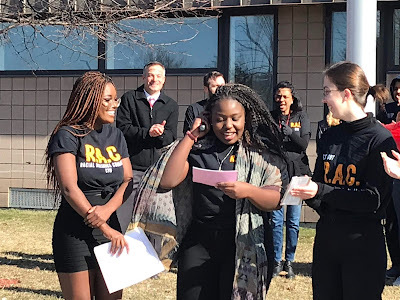 This morning, the RAC welcomed all students, faculty, and community members. There were presentations and the Women's Chorus sang. 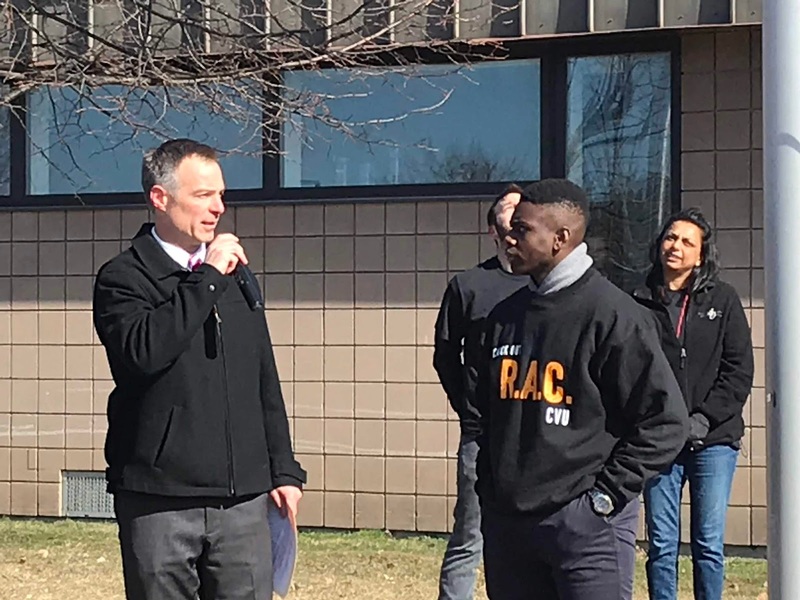 Closing remarks were made by Principal Adam Bunting and the Racial Alliance Committee. 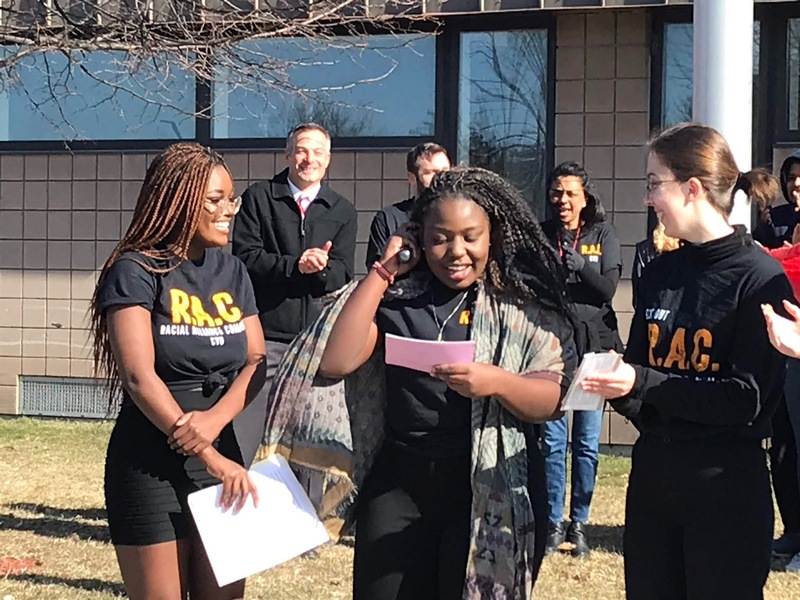 We appreciate and applaud all students for sharing their points of view and compassion for others in a respectful, articulate, and democratic manner throughout this process. Each year at the end of March, a special history-based event takes place at Vermont Technical College in Randolph. The event is called 3D Vermont. 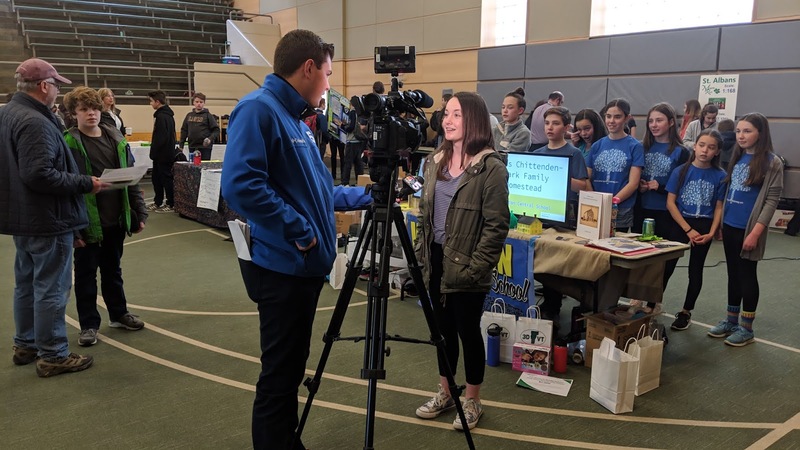 Teams of students from middle and high schools across Vermont share their learning and a piece of local history. They also compete in an effort to showcase their learning and design skills. Each team studies a building in their town's history. The learn about the building, it's story, and it's place in the town. They interview people and do extensive research. After that, they use a program called Sketch-Up to design a 3D version of the building. A 3D printer is used to create and print a replica of the building from their design. 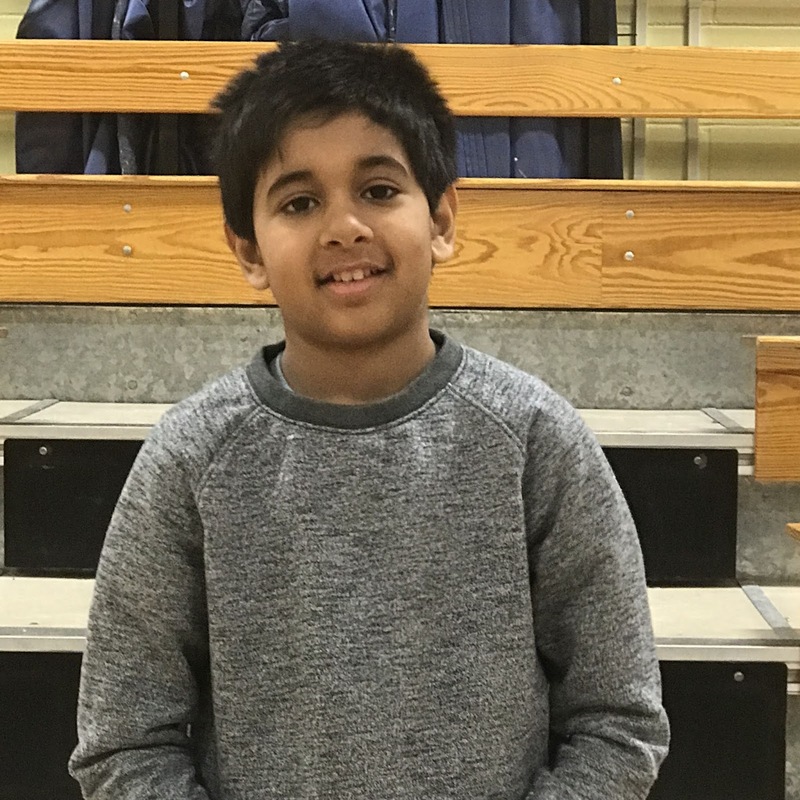 Williston Central School's Voyager team has sent a team to 3D Vermont for each of the last 4 years. Each year the group has learned about a different building in Williston. This group of students, led by teacher Aron Merrill and librarian Ellen Arapakos, met once a week after school for many weeks doing the necessary work to prepare for the event. And today, it all came together for them. They shared their learning with judges via videos of their process and a physical display. They showcased their 3D model of the Thomas Chittenden/Clark Family Farm in Williston. And they came away with a first place win for a middle school team. Bravo to all of the students and their teachers for a job well done! Watch for them on tonight's TV news too. 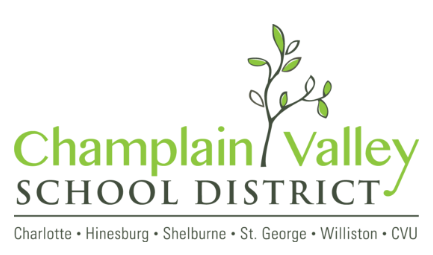 For many years now, the Champlain Valley School District has hosted a legislator breakfast. Invited are members of the House and Senate from districts represented by our communities, along with the Governor and Lieutenant Governor. This year's breakfast took place this morning at CVU. Six guests from Montpelier joined seven School Board members along with some of the CVSD leadership group. Joining us today were: Terence Macaig, Kate Webb, Virginia Lyons, James McCullough, Jessica Brumsted, and Mike Yantchka. During the breakfast, the legislators shared updates about the work of their various committees, with a special focus on how that work may impact education and our schools. Today's topics included lead in the water supply, Act 46, E-911 compliance, weatherization of our schools and homes, prevention programs, mental health programs, childcare and preschool programs, and e-cigarettes. The conversation was informative and extremely helpful. In return, the legislators wanted to hear about issues we're working on and are facing in our schools. They also took the time to applaud the work of CVSD, our educators, and especially our students. 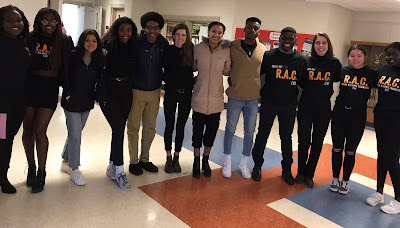 From them we heard accolades for our students who present at the State House and how poised, articulate, and informed they are on many topics about which they're passionate. 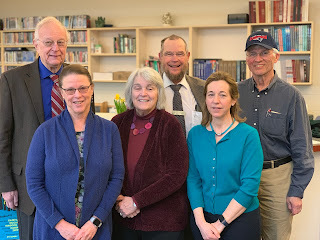 We thank those who devoted their time to connect with us today and for their dedicated work on behalf of our students, families, and all Vermonters.